A strawberry is a small fleshy red fruit favored in desserts or eaten on its own and is usually sold in small baskets known as punnets. Strawberries contain no fat, are very low on calories, and are a rich source of vitamin B6, vitamin C, folic acid, potassium and fiber so are often included in dietary programs or given to children. The strawberry is part of the rose family of plants and is actually a herb, while the red fleshy part that we eat is actually part of the flower and isn’t a berry at all. 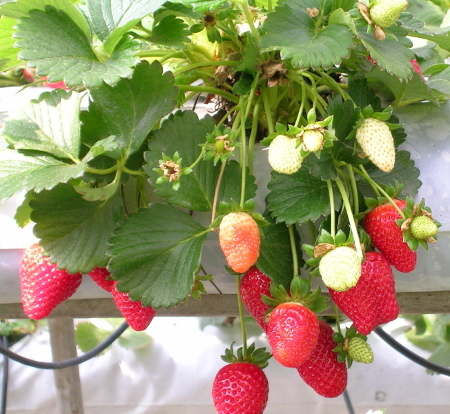 Strawberries are found growing natively in the Americas, Europe, and Asia, and varieties have been successfully grown in Africa and Australasia as well. 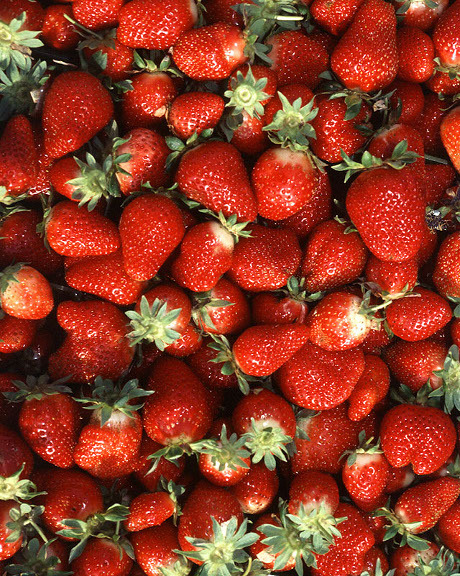 The fat and juicy red varieties commonly sold today are all descended from varieties cultivated after the discovery of strawberries in North America, and then bred with varieties discovered in South America to increase their size and improve taste. During Roman times the fruit was known by it’s latin name Fragra meaning fragrance, although in modern Italian it is known as fragola, but the name used in England by the nobility was the French word fraise until the common English name gained popularity from the late middle ages. The word strawberry is believed to come from the old english words ‘streaw’ and ‘berige’ joined together and linguists believe the word straw came into use from the straw-like runners that grow from the plant. Popular legend has it that the word actually derives from the practice of farmers placing straw under the plant to prevent the fruit from touching the ground and becoming spoiled. Strawberries weren’t considered a major crop so often children from London and other towns would be allowed to pick the fruit themselves which they would tie onto pieces of straw to sell in the town markets yelling “straws of berries” to get attention. Many of the children weren’t educated and would mispronounce their call as strawberries. In traditional Chinese medicine, probably from as long ago as the time of the Yellow Emperor who is known to have ruled China for most of the 26th century BC, and whose court physicians would use the leaves of the strawberry plant to make a weak tea that is thought to detoxify the body and aid in reducing the effects of aging. Naturalists and historians are not certain when strawberries were first eaten by humans, certainly the varieties available in Europe and Asia where civilization and the art of writing was developed were small and not terribly sweet tasting so are never mentioned as a delicacy until Roman times. Cato the Elder, a Roman senator and literary author who lived around 234-149BC wrote that strawberries were served in bowls with water at festivals. Pliny the Elder, also known as Gaius Plinius Secundus who lived between 23 and 79 AD, mentions strawberries as one of the native fruits of the Italian peninsula in his seminal encyclopedia ‘Naturalis Historia’ first published in 77AD. The fruit are not believed to have been terribly popular but nevertheless Pliny states they were taken to other parts of the empire by Roman settlers and traders. St Hildegard of Bingen who was a medieval seer and visionary, and also head of a monastery on the banks of the Rhine river who wrote an important tome on natural healing. Her advice was actively sought throughout medieval Europe by popes, kings, and bishops and it was because of St Hildegard that strawberries went out of favor. Seeing a snake amongst the strawberries in the monastery garden that had just eaten a toad St Hildegard declared that strawberries should not be eaten by people because they were too easily contaminated by undesirable animals and would poison the human body with mucus that would fill the lungs leading to eventual death. North American native people in Massachusetts were not farmers and would hunt or forage for what was available, and strawberries which they named wuttahimneash, roughly translated as berry of the heart, would eat strawberries as a favored dessert. White settlers who came into contact with native people would trade items like blankets and guns for food which wasn’t accessible to them, and by a happy coincidence strawberries were amongst the fruits offered quickly becoming a firm favorite that would be requested time and again. It wasn’t long until Massachusetts settlers were growing strawberries themselves for sale in their own markets. By the middle of the 1700s the North American strawberry had been cross bred with the traditional European varieties and was becoming popular on the social scene not just as a fruit, but also as an ingredient of small desserts. A number of new varieties were developed for the sweetness of the taste and perfect size and coloring. Strawberry preserves were also reinvented becoming the precursors of todays jelly and jams. Charles Linnaeus, a Swedish botanish and doctor of the 1700s prescribed a diet of only strawberries believing that rheumatic gout could be cured if strawberries were eaten every day. According to Linnaeus the leaves of the strawberry could be dried served in tea and would help cleanse the bowel and relive acid buildup. Evidence using modern medicine suggests none of this is true, the strawberry is nothing more than a tasty treat. During the late 20th century strawberry flavored beauty products have become popular leading to a substantial increase in the cultivation of strawberries with many products such as facial cleansers, shampoos, soaps, and moisturizers requiring high quantities of strawberries in direct comparison with the number used for desserts. I used to be recommended this blog through my cousin. I’m no longer sure whether or not this publish is written via him as no one else recognise such designated about my problem.